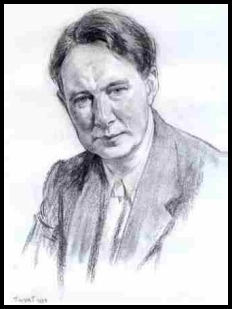 This is an excellent example of Nevil Shute's signature, along with a dedication to Kathleen Short, believed to be a friend and a member of an aviation family in England. 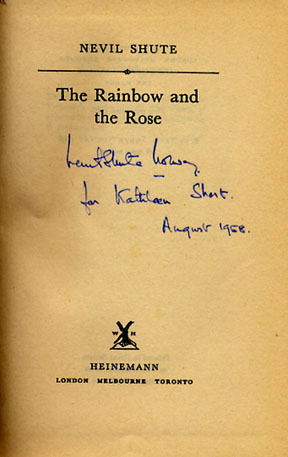 The signature and inscription appear on a Heinemann first edition of The Rainbow and the Rose. 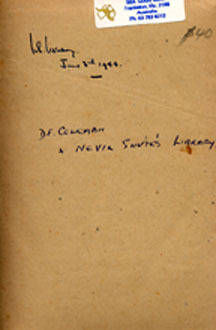 This signature appears on a later edition of What Happened to the Corbetts. The book was presented by Nevil Shute to the Greenwoods, the farm manager and his wife at the Norway farm in Langwarrin. 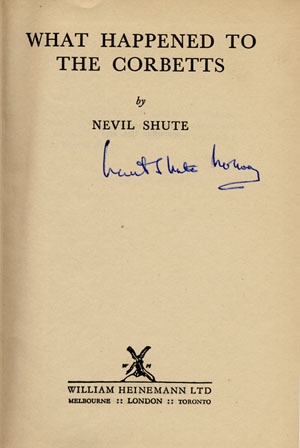 This signature appears in a copy of The Grapes of Wrath, a book from Nevil Shute's personal library. It differs from other signatures in that he only used his initials and last name.